DANGERS OF FLUORIDE | "Global Possibilities"
Your most likely encounter with fluoride is probably at the dentist, as fluoride treatments are common in traditional dental practices to prevent tooth decay (with strong opposition of course). But that’s not the only place you’ll be exposed to the dangerous effects of fluoride, as it is also added to your drinking water, found in toothpaste, tea, and perhaps the most forgotten source – processed foods. 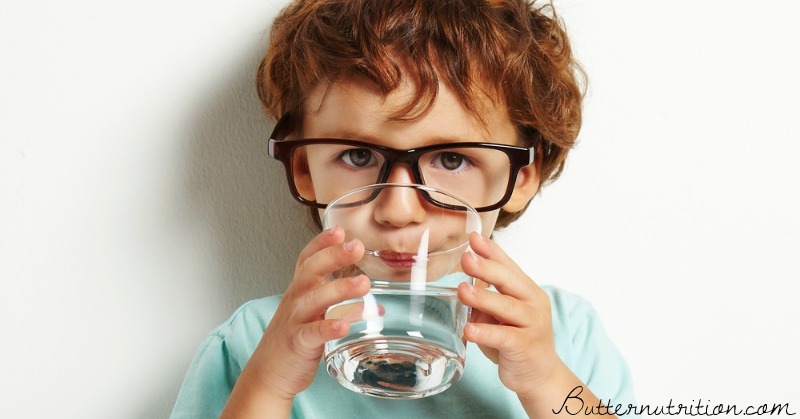 In April of 2015, Federal Health Officials decreased the recommended fluoride level in drinking water; the first time the recommendation has decreased in 50 years. The longstanding range of 0.7-1.2 milligrams of fluoride per liter (mg/L) of water issued in 1962 was almost cut in half, now reflecting only the lower value of the range; 0.7 mg/L. The cited reason for the change was not only to prevent dental fluorosis, a condition that can stain tooth enamel causing a spotted or blotchy white appearance, but also because health experts say Americans have more regular access to fluoride from other products like mouthwash and toothpaste; increasing total fluoride exposure. This change was also just on the heels of one of the most prestigious medical journals, The Lancet, officially reclassifying fluoride as a neurotoxin (meaning toxic to nerve tissue) in 2014. Fluoride’s opposition is strong. 97% of western Europe has rejected water fluoridation on grounds that it’s unethical. It’s also not a nutrient, and several studies link it to serious health issues including low IQ in children and even hypothyroidism. Yet, there it is, every time you take a drink. 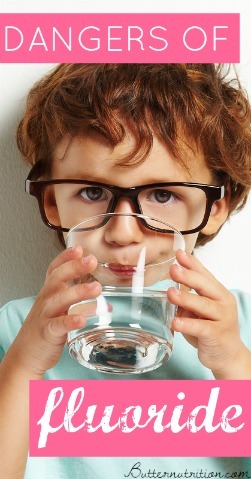 A 2012 study in the Environmental Health Perspectives found that “children in high-fluoride areas had significantly lower IQ scores than those who lived in low-fluoride areas.” Researchers also noted the risk of fluoride exposure during early brain development, when the brain is more susceptible to permanent damage. Combine that with data from the Fluoride Action Network that states infant formula mixed with fluoridated water delivers 100-200 times more fluoride than breastmilk, and the infant risk of increased fluoride exposure on a developing brain becomes startlingly real. Good nutrition is a much better way to prevent dental carries than the poorly supported argument for fluorinated water. Dr. Weston Price (1870-1948), an America dentist from Cleveland in the early 1900’s embarked on a research journey around the world to find out “what was a healthy diet” and what caused tooth decay. His findings laid the groundwork for proper nutrition and cavity-free teeth. The common theme he found was that when processed foods arrived in the food stream, the tooth decay rate increased from about 1% to around 30%. He also found that the traditional foods contained 10 times more fat soluble vitamins more and 2-4 times more minerals than a refined diet. When the processed food diet was passed on to the next generation, teeth crowding and dental deformities became commonplace. Even if you were to eliminate the largest sources of fluoride coming into your body, past exposure has a long-lasting effect. According the Dr. Mercola and the Fluoride Action Network, “First, about half of the fluoride you consume is excreted through your kidneys into your urine, while the other half becomes bound in your skeleton. The fluoride that enters your bones is eliminated very slowly. The NRC estimates the biological half-life of fluoride in bone (the time for half of it to be removed) is as long as 20 years.” This of course, is only made worse if you always have a steady stream of fluoride entering your body, increasing the fluoride faster in your body than can be removed. One of the easiest ways to reduce your exposure to fluoride is by getting it out of your drinking water using a water filtration system designed to remove fluoride (like the Big Berkey with the PF-3 filters). I’d been meaning to get one of these wonderful water filters for a while, but with my recent fluoride research and testing my own drinking water (you can view my report here), it was a great time to make the change. Eat less processed food. The more processed a food, the more fluoride it contains. Watch your intake of tea. Tea plants absorb fluoride from the soil resulting in high fluoride levels in the leaves. Choose fluoride-free toothpaste and seek out a holistic dentist that is aware of the dangers of fluoride. Ready to take the first step in your fight against the dangers of fluoride? 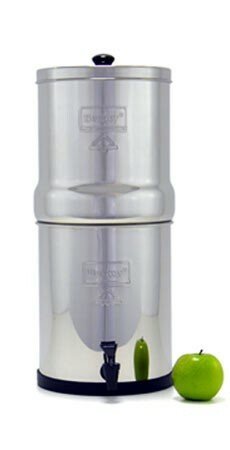 Find the Berkey water filtration with PF-3 filters here or buy it on Amazon. How do you feel about the dangers of fluoride? Please share in the comments! Disclaimer note: I received a free Big Berkey water filter in exchange for mentioning the company in this post. However, I was going to write this post and recommend them anyway (I’ve been a fan of their products for years), so it in no way influences my research or position on fluoride. Fluoride is highly toxic and a cumulative poison, like lead, arsenic, and mercury. I have asked many forced-fluoridation fanatics to tell me how much accumulated fluoride in the body they think is safe. So far not a single one of them has been able to answer the question. It is unlikely to just be a coincidence that the US, Australia, and Ireland, which have had high rates of forced-fluoridation for decades, also have high rates of joint problems, and poor health outcomes in general.